In Earth's distant future, Tyndel is both teacher and mentor, a staunch devotee to his conservative and rigidly structured religious culture. Then a rogue infection of nanotechnology transforms him into a "demon", something more than human, and he is forced into exile, fleeing to the more technologically advanced space-faring civilization that lies to the north, one that his own righteous people consider evil. Although shaken by his transformation, he has the rare talent required to become a space pilot. Although Rhennthyl is the son of a leading wool merchant in L'Excelsis, the capital of Solidar, the most powerful nation on Terahnar, he has spent years becoming a journeyman artist and is skilled and diligent enough to be considered for the status of master artisan - in another two years. 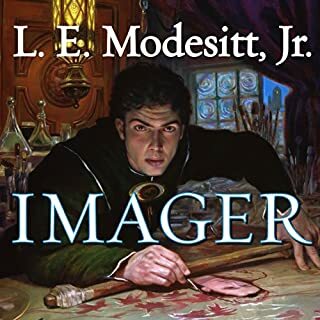 Then, in a single moment, his entire life is transformed when his master patron is killed in a flash fire and Rhenn discovers he is an imager. 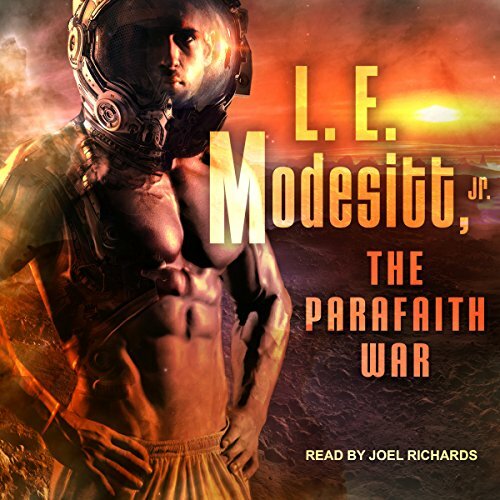 Earth, the peaceful capital of a long-fallen interstellar empire, is confronted by deadly violence when the warships of a former colony attack, and it is up to planetary coordinator Ecktor deJanes to eliminate the menace without violating Earth's non-aggression principles. 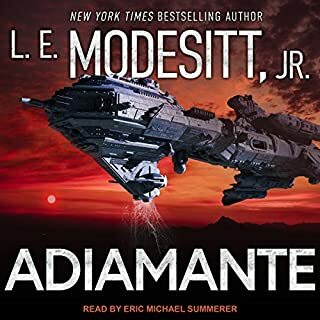 Adiamante is a very fascinating story. Young Lerris is dissatisfied with his life and trade, and yearns to find a place in the world better suited to his skills and temperament. 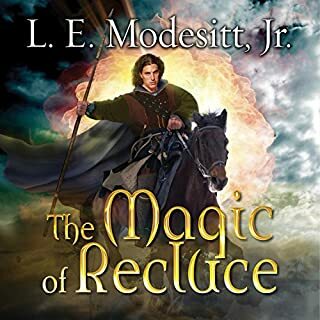 But in Recluce a change in circumstances means taking one of two options: permanent exile from Recluce or braving the dangergeld, a complex, rule-laden wanderjahr in the lands beyond Recluce, with the aim of learning how the world works and what his place in it might be. Many do not survive. Lerris chooses the dangergeld. You can't militarize space. This one rule has led to decades of peaceful development of space programs worldwide. However, increasing resource scarcity and a changing climate on Earth's surface is causing some interested parties - namely India, the North American Union, and the Sinese Federation - to militarize. The discovery of a strange artifact by Dr. Alayna Wong precipitates a crisis. What appears to be a hitherto undiscovered comet is soon revealed to be an alien structure on a cometary trajectory toward the sun. You've got mail in the 21st century. After finding out that he has unusual powers, he is banished from the planet Karnak. 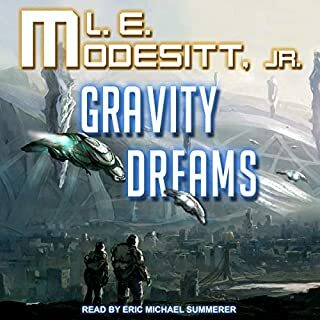 Thrust into the tranquil world of Aurore, vacation paradise for the galaxy, Martin finds that the reality of this planet is much different from its serene veneer. The gods are wantonly cruel and indifferent to the chaos they cause: Are they really gods or just men and women with larger-than-life powers? Whatever the answer, Martin Martel must challenge their supremacy to defend his life, love, and the fate of the galaxy. Millennia ago, a magical disaster caused the fall of a great worldwide civilization, the end of a golden age. New civilizations have fought their way up from the ancient destruction and chaos, knowing little of the lost world that preceded them or the details of its fall.C orus today is a world of contending countries, of humans, but also of strange animals and supernatural creatures. It is a place of magical powers and of a few people who are talented enough to use them. Alusius, the hero of the story, is one. What lies beneath the millions of orbiting nanotech satellites that shroud the world called Haze? Major Keir Roget's mission is to make planetfall in secret, find out, and report back to his superiors in the Federation, the Chinese-dominated government that rules Earth and the colonized planets. For all his effectiveness as a security agent, Roget is troubled by memories of an earlier mission. Some bad ideas go back a long way, and this one goes all the way back to the original home planet: Someone's god told them they had a right to more territory - so they figure they can take what they want by divine right. In the far future among the colonized worlds of the galaxy, there's a war going on between the majority of civilized worlds and a colonial theocracy. Trystin Desoll grows up fighting against religious fanatics and becomes a hero, a first-class pilot, then, amazingly, a spy. What do you do if you're a relatively humane soldier fighting millions of suicidal volunteers on the other side who know that they are utterly right, and you are utterly wrong, with no middle ground? Trystin Desoll has an idea. 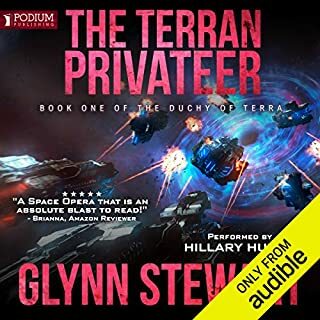 I had faith they would do this audiobook! 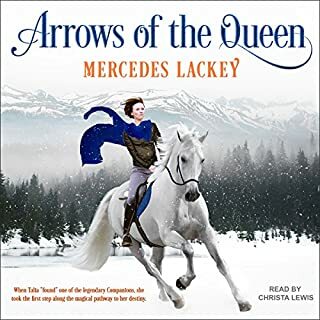 When i first got into audiobooks, this novel was one of the ones I searched for. I am glad they finally made it and made it well. This novel is science fiction the way science fiction should be. Yes it tells a story of how humanity might be in a far distant future beyond this stellar system. However it does not forget that good stories depict a human story. This story follows Trystan Desol as he learns about cultures and the ways cultures meet and interact. This is a heroic story of a human choosing how he wants to live. Joel Richard does a wonderful job with his performance. I started hating this book from the beginning. I thought it was going to be a run of the mill military sci-fi story. You know the routine...sweat through basic training, become a pilot, kill a bunch of aliens or other bad-guys, rinse and repeat until you get wounded, meet a beautiful but unapproachable female (maybe a nurse) fall in love, win the war. I really loathe those books. This one has some nuance, however. this one is a little different. It portrays a more realistic picture of combat...weeks of boredom punctuated by moments of soul-scorching terror. The final part of the book gets more cerebral. What makes people enemies? Is there any point to retribution or revenge? The essence of people is the same, we are all subject to the prejudices and fears we are taught. There is no point in blind hatred and while we may continue to differ in opinion from our "enemies" we can learn to understand that while our differences may persist, we can still live together and prosper. I have loved this book since my first read many, many years ago. it was one of the books I was hoping to be made into Audio. Long build-up that goes flat at the end. The author spends 95% of the book with a slow long build-up, then its over. The end seems like it was squeezed out at the last minute, and is not really plausible. The whole book is a case study; in a false equivalency between religious fanatics and rational people.